Unlike most other MCP detector system, the RoentDek delay-line detectors such as DLD40 and DLD80 have a high ability to detect multiple particle hits (multi-hits) and analyze the position and time coordinates ("3d-detection") for each individual particle (hit). However, if the relative arrival time (timely pulse pair distance) between two individual hits is of the order of the electronic pulse duration in the front-end electronics or below, the information on these hits might be lost or become ambiguous. Furthermore, the pulse-pair resolution limit (pulse pair dead time) of the used multi-hit TDC can impose another limitation on the acceptable timely pulse pair distance, e.g. for the RoentDek detector system with multi-hit TDC the pulse pair dead time is 10-15ns. If two hits are closer in time they can still be recovered if the relative distance in x and y position exceeds a certain value. For details please follow this link. Of course these consideration are also valid for a particle shower with more than two hits. Then the smallest timely pulse pair distance between any two hits applies for the above considerations. It can be shown that by having a redundant third delay-line layer a complete and unambiguous recovery of multi-hits (with two or more particles) can be done if the relative timely OR spatial relative distance between any two hits is above the pulse-pair dead-time Dpp or Dpp × v^, respectively (see this link). A delay-line anode with three layers for redundant multi-hit detection. In easier but less precise words: the hexagon delay-line anode is only blind for a hit pair if the particles come at the same time AND at the same position. Recovery ratio as function of the spatial separation (in mm) of a pair of particles with identical TOFs, for DL80/Hexanode75 and 10ns electronic dead-time. Below: Double-hit blind zones for DL80/Hexanode75 (in mm). Plotted are relative distances between particle one and two. 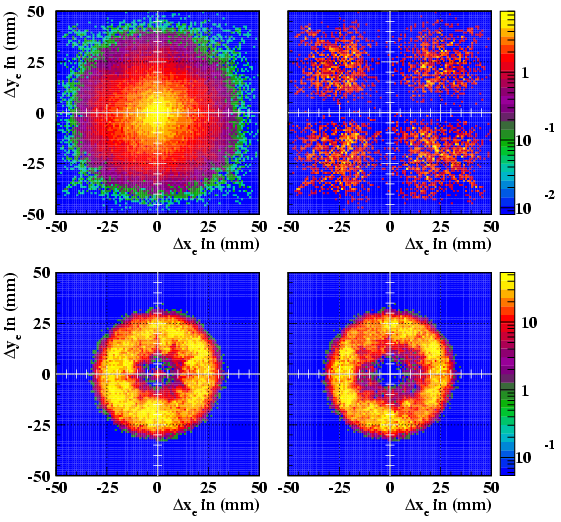 This situation of particle pairs arriving at the same time AND at the same position is very often excluded for physical processes as for example in case of a breakup of molecules (see next figure). For such processes the Hexanode removes any limitation of the delay-line method for multi-hit detection. RoentDek has introduced the HEX75, an 80 mm active delay-line detector as a standard product in 2001. 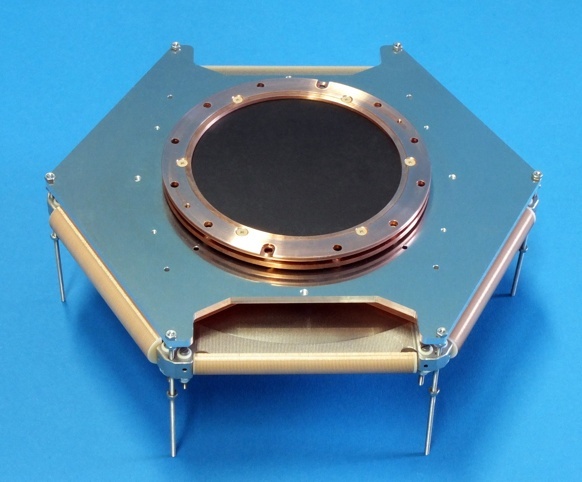 Hexanodes for 50 mm and 100 mm detection diameter have also been produced recently. The multi-hit ability of the Hexanode brings up the idea of using it for doubling count rate in experimental situations where only single hits are of interests but event rates are limited by the repetition rate of the ionizing source. An example is laser-driven ionization with fix rep rate but where the particle yield can be tuned (modifying intensity or target density) in the sense that more than one particle per shot is released towards the detector (see this link). The same redundancy that allows for an advanced multi-hit recovery also enables determination and correction of image non-linearity, which is to some extent inherent to the individual delay-line arrays on any DLD. 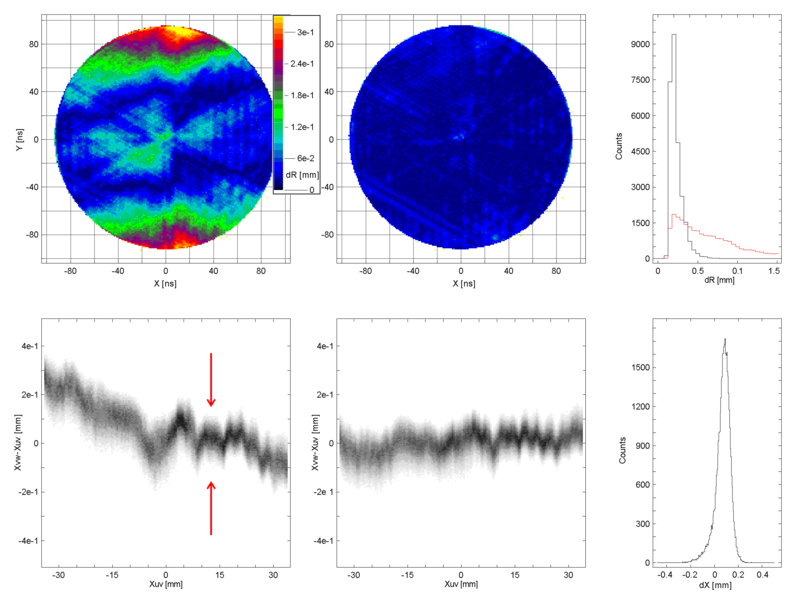 For the Hexanode an inherent calibration map can be produced which allows to improve global imaging linearity for single and multiple hit events. Figure: Plots illustrating the linearity and resolution control with a Hexanode. The amount of non-linearity in an image is mapped in the histogram up left where the deviations between measured positions using different layer combinations are displayed in the z-value (color-coded) for all X/Y positions on the detector (here: open face MCP detector with helical-wire Hexanode of 75mm active diameter). The deviations are due to linearity errors on the delay lines (lower left image: typical linearity deviation along a delay line). After correction for the deviation function the imaging properties can be significantly improved (middle images), down to the level of the local resolution error. The graphs up right show a 1d histograms of the abundances of certain position deviations in the image before (red) and after the correction, allowing a quantification of the detector linearity. Furthermore, the residuals in the linearity correction function allow the determination of local resolution (lower right image: projection at an arbitrary position indicated by red arrows). FWHM resolution of 110 micron in this plot corresponds to spatial detector resolution of about 60 micron FWHM.